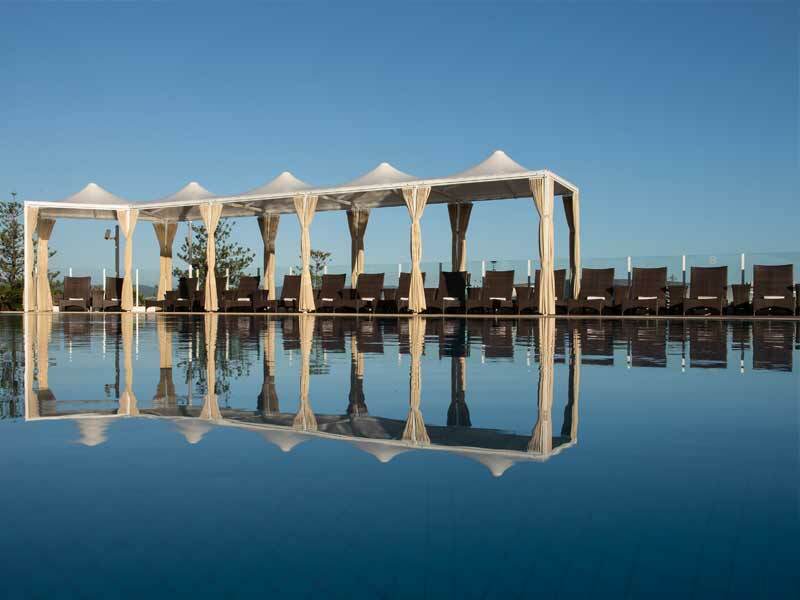 Indulge in a luxurious 5-star holiday at one of the most perfectly situated hotels in Broadbeach, Sofitel Gold Coast Broadbeach. Breathe in the revitalizing sea air as you reconnect with the world around you from this coastal, yet luxurious, beachfront hotel. You couldn’t possibly find a better location on the Gold Coast’s gorgeous coastal suburb, Broadbeach. 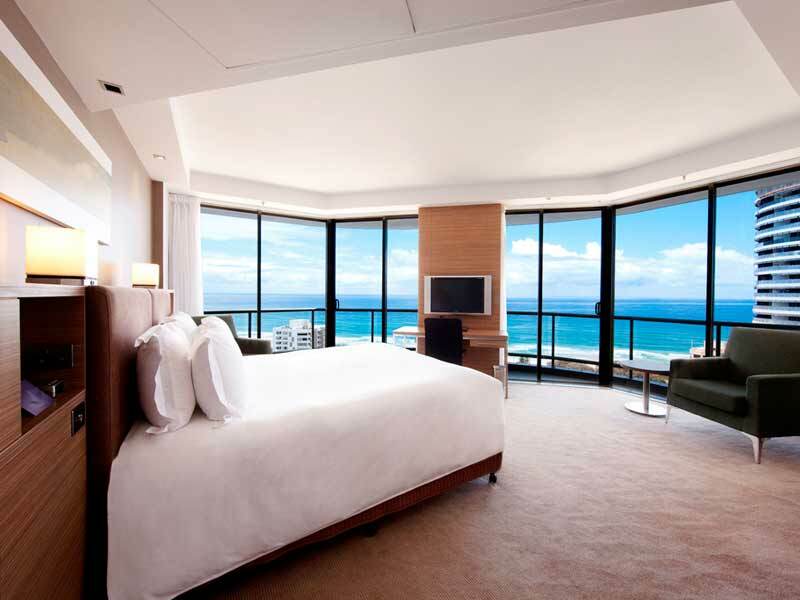 Sofitel Gold Coast Broadbeach is just a short stroll from the white sands and warm waters of the beach and Pacific Ocean and most rooms feature sweeping views of the crashing waves. 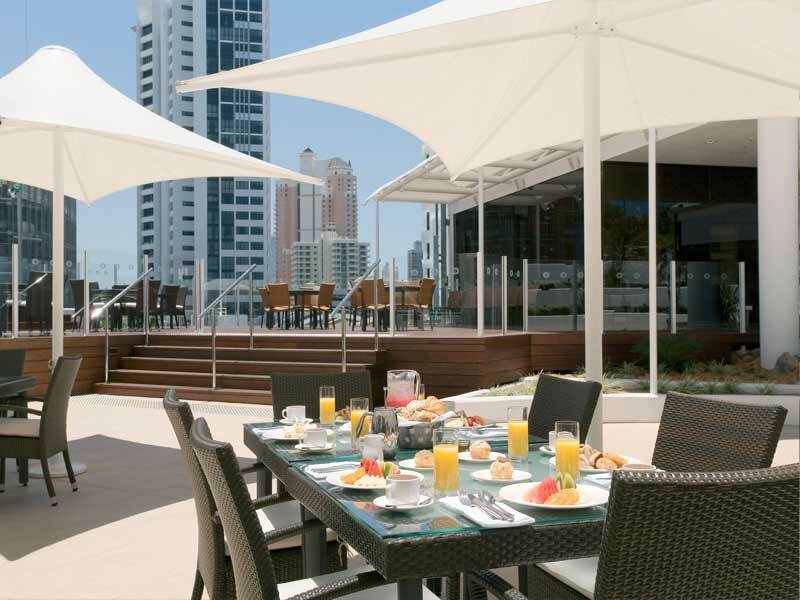 A selection of bars, restaurants and high-end boutiques surround Sofitel Gold Coast with the beachfront mall, Oasis Shopping Centre, connected to the hotel. The iconic Pacific Fair Shopping Centre and The Star Casino are within walking distance as is the Broadbeach Tram Station, your gateway to discovering the Gold Coast! 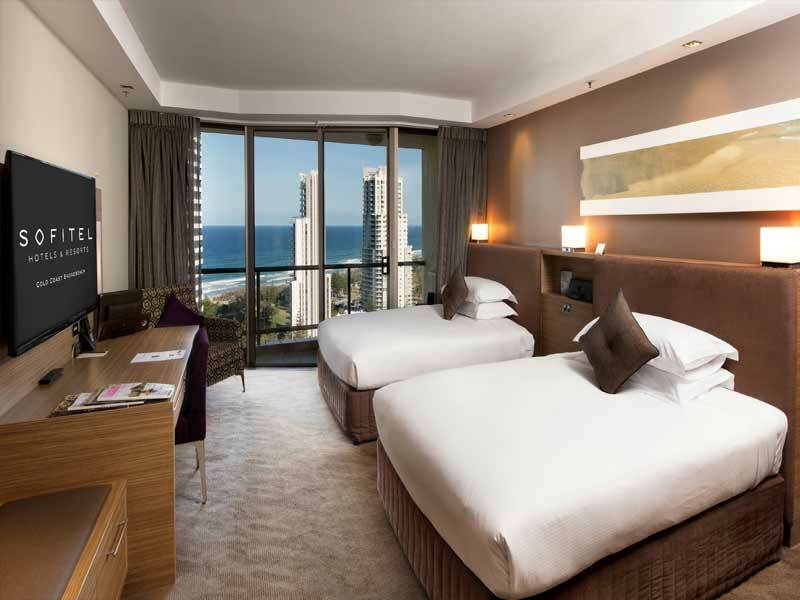 Each of the 196 elegantly appointed rooms and suites at Sofitel Gold Coast Broadbeach provide a sophisticated and comfortable place to lay your head after a day of exploring the Gold Coast. The rooms and suites were designed with your comfort in mind so you can rest assured knowing the amenities within the light filled spaces are everything you need to make the most of your Queensland holiday. 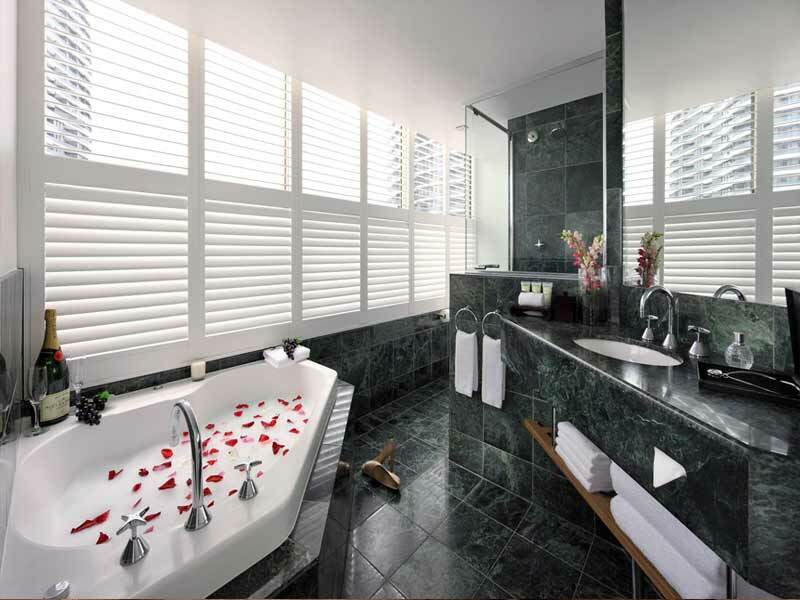 The Sofitel luxuries aren’t just found in your room but all over the hotel as well. Award-winning restaurant, room81, provides a phenomenal culinary journey of modern Australian degustation where the talented chef serves unique and delicious delicacies course by course. If fine dining isn’t your cup of tea, you can get a taste of the French bistro classics at Bistro On3. Don’t want to miss that footy game? Sofitel Gold Coast has you covered with TC’s Bar & Gaming Lounge serving drinks and meals while all the sporting action you could ever hope for is projected onto the big screens. There’s two swimming pools to choose from and there is a tennis court for you to practice your serve. 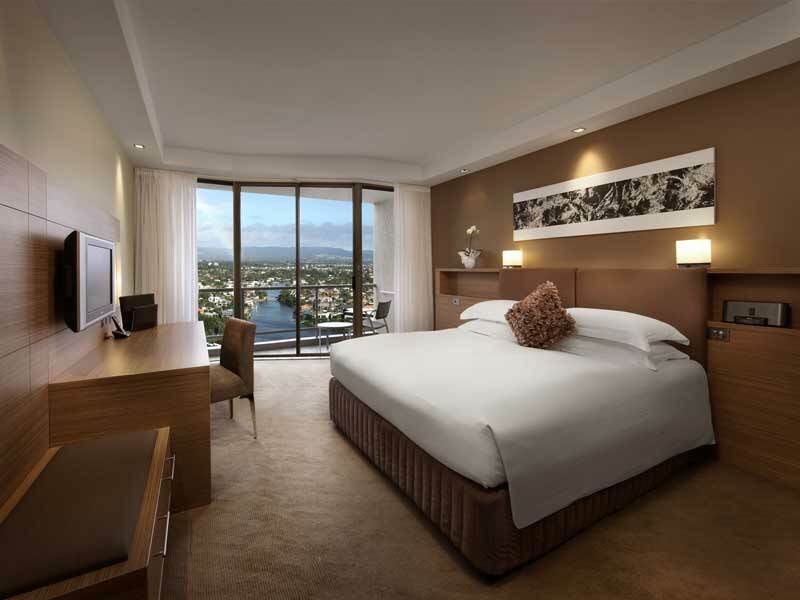 Why go to Sofitel Gold Coast Broadbeach? 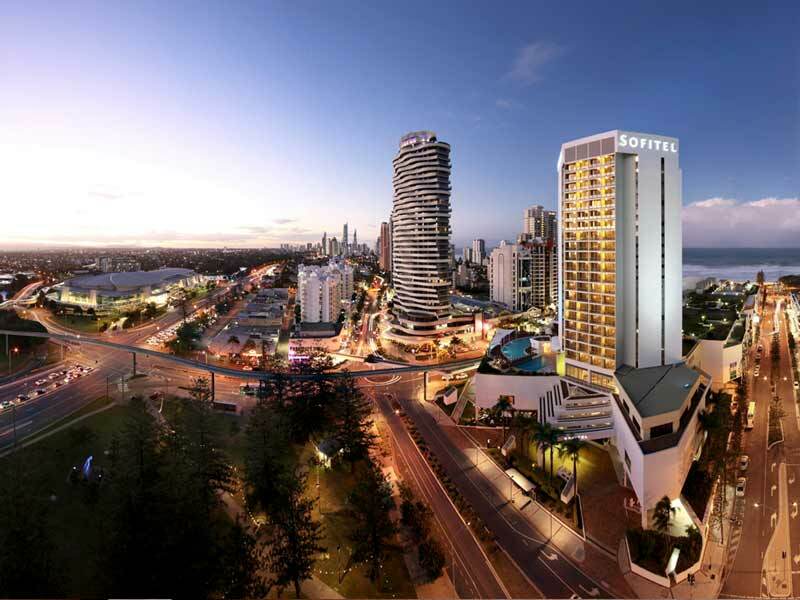 A hotel jam-packed full of 5-star luxuries in a prime location, it’s hard not to fall in love with Sofitel Gold Coast Broadbeach. Take in the panoramic ocean views as you float around the rooftop swimming pool; Walk a few minutes and feel the soft white sands between your toes and surf the crashing waves; Feast on a gourmet degustation meal at the award-winning, two chef hat restaurant, room81; Venture to the attached Oasis Shopping Centre for restaurants, bars, boutiques and public events; Unwind in a hotel Jacuzzi and so much more! 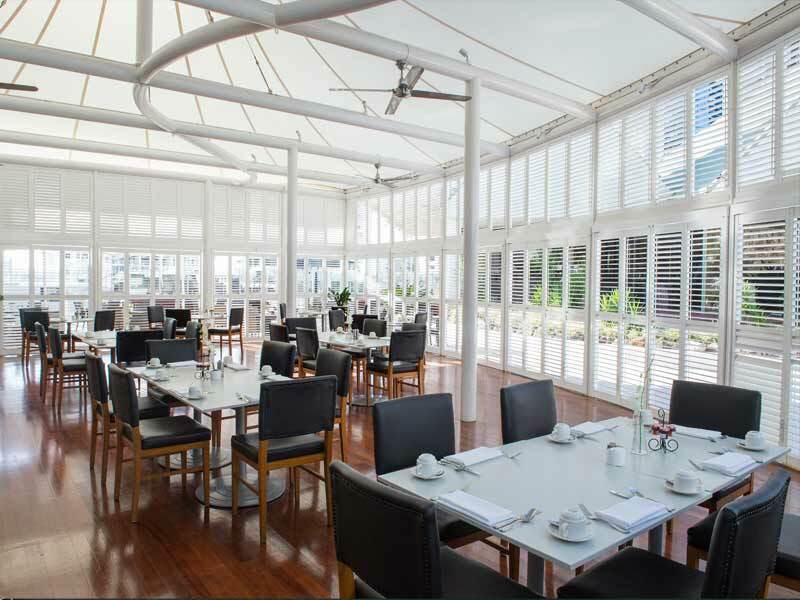 Featuring chic and charming décor with artwork reflection the Australia coastal culture, the Classic Rooms feature picturesque views of the river and Gold Coast hinterland, best observed from the private balcony. Guests can choose their bedding configuration according to their travelling party, with a choice of king or twin size bedding. The bedroom connects the ensuite bathroom that’s complete with a separate bath and shower, hair dryer, bathrobe & slippers and extra large and soft bath towels. There is an array of other luxuries too such as air conditioning, tea/coffee making facilities, LCD TV, Wi-Fi and more. 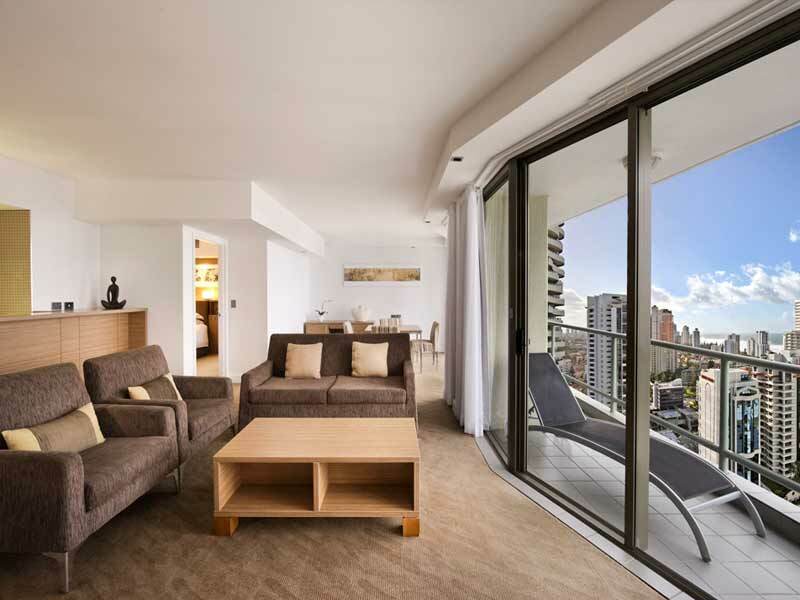 Just a 30 minute drive from the Gold Coast Airport, the Sofitel Gold Coast Broadbeach is located just minutes from the sand and surf, and also close to the events and nightlife of the city. It is close to public transport links and also has undercover parking available (extra charge). 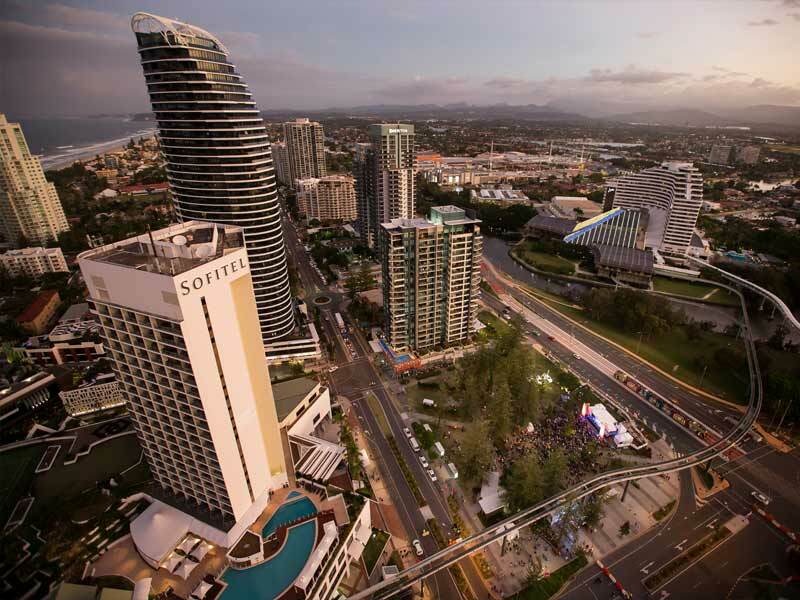 The prime location of Sofitel Gold Coast Broadbeach means you’ll never run out of things to do! At the resort itself guests can swim in one of the two swimming pools, one located on the rooftop with sweeping views of the beach or keep on top of your fitness routine at the well-equipped SoFIT gymnasium. TC’s Bar & Gaming Lounge is the go-to for enjoying a refreshing beverage and watching the game on the big screen, whereas Bistro On3 serves up French inspired bistro classics for you to enjoy. For a gourmet fine dining experience you won’t want to miss out on dining at room81, the award-winning Australian degustation. The resort is connected to the Oasis Shopping Centre, a beachfront mall with a range of places to go and things to see. Shop at the range of boutique stores, grab a bite at one of the many restaurants featuring all kinds of cuisines and stop in for a cold drink at a funky bar. Oasis Shopping Centre is home to a host of events and music festival too with everything from country to jazz! The new and improved Pacific Fair Shopping Mall is within walking distance too. The recently renovated mall is packed full of department stores, high-end fashion labels and street shops. The iconic The Star Casino only takes a few minutes to access so why not test your luck before heading next door to Dracula’s for a vampire themed cabaret dinner and show. The golden sands of the beach are just steps away from the hotel too, making it easy for you to dive in the warm Gold Coast waters! We stayed at the Sofitel Broadbeach recently and this hotel didn’t disappoint. Our room was spacious and wonderfully appointed with a modern & large bathroom and plunger coffee facilities as well as normal tea & coffee. 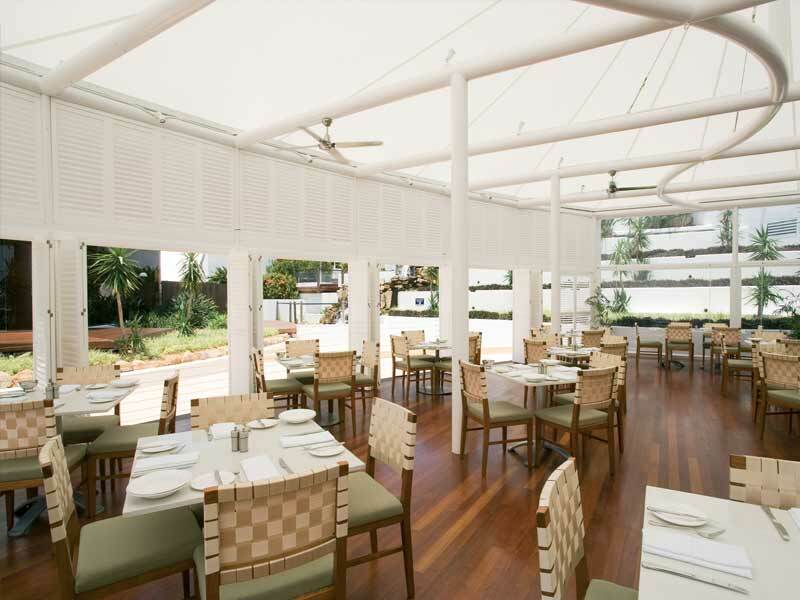 This hotel is in a great location, close to restaurants and an easy walk to the surf beach. It also has 2 swimming pools and stylish outdoor lounges.